For several weeks we've had sizzling summer heat and today has been a welcome relief. It wasn't as hot and you could actually spend time outside without dashing from one air conditioned place to another. Severe thunderstorms rolled in early this evening and while the winds were pretty amazing we escaped the hail that was predicted. We stood on my brother's front porch and watched as the storm arrived and the first part passed. Realizing that we were about to get the part of the storm that was the most violent, we retreated to the inside and for the first time in weeks they turned on the attic fan and opened the windows. It was wonderful to feel and smell the cool fresh air coming through the windows. It's almost time for me to brush up the crochet skills again. Tonight I finished the repeat of color B and begin introducing color A. The shawl is finished with a row of single crochet into which you work 2 rows of a chain and slip stitch edging. 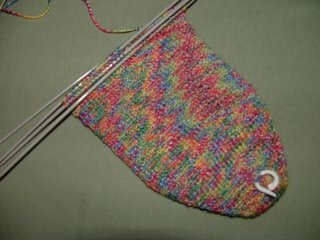 I'll stay up and finish the knitting and begin the edging tomorrow. 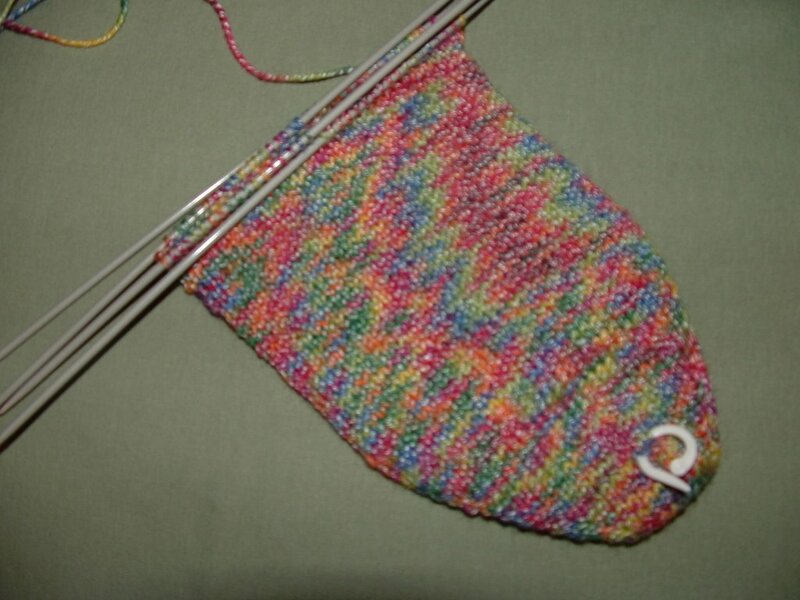 After working some more rows on the corded rib socks, I've noticed not only pooling but stacking and now flashing. 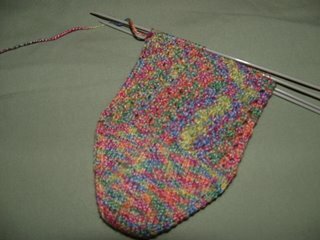 The yarn gives me no choice but to ignore the overwhelming urge to match socks that I experience when knitting with self-striping yarns. The current issue of Interweave Knits arrived Thursday. There are several projects that immediately caught my attention in this issue. 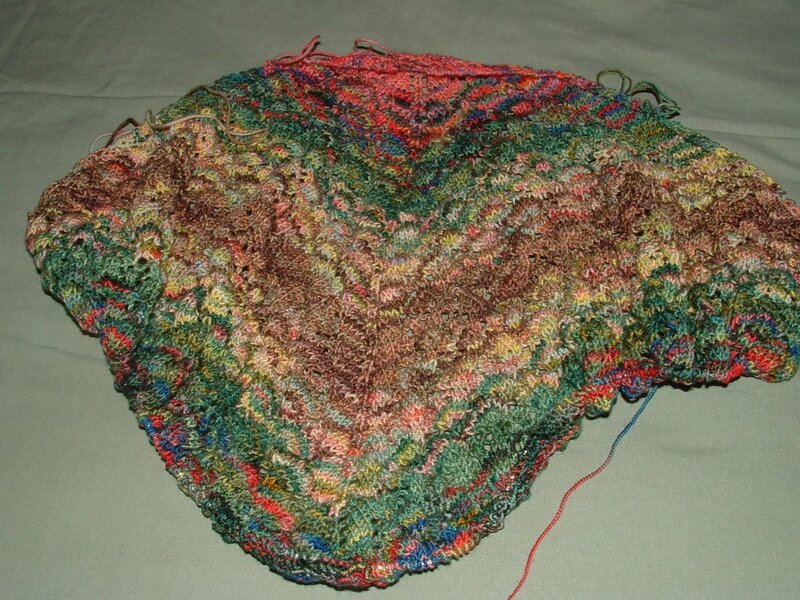 I'm definitely going to knit the Swallowtail Shawl designed by Evelyn Clark. I've been looking for a project to knit for our next door neighbor who always checks on me if I'm sick and mom's out of town. Last month I purchased some red zephyr with her in mind. It's not quite enough for a large shawl but it's more than enough for a small shawl. And finally, the renovation has resumed with the installation of insulation in the walls. They probably would have finished the job if the attic was composed of more than just rafters. Thank goodness our original house is far better insulated than we would have ever thought for its age of 40+ years. If it wasn't, our light bill would be astronomical with all the leaks and cracks around the boarded up windows and the open attic between the old and new sections. Monday is their return date. It should be very interesting when they have to face my sister due to mom's being out of town. How I wish that I could be a fly on the wall for that encounter! I love Judy's magic cast on. 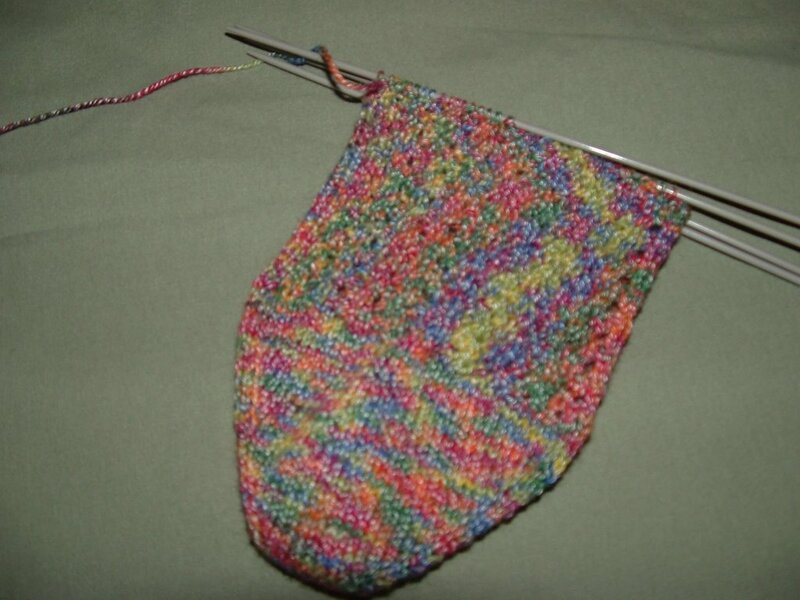 I'm currently knitting the 3rd pair of socks toe up with a dutch heel. Neve going back to cuff down (one should never say never, but). The shawl looks great, I love the colores. Great job! thanks for commenting on my blog. I love Koigu in general- so your project looks great to me! thanks for the magic cast-on tip/link. I have been wanting to try thatfor a while. maybe my next pair of socks.